Congratulations to the winners of the 2016 AIA|DC Chapter Design Awards! This year we had a single jury look at all of the submissions to make their final selections. Out of the 205 submissions, 16 were chosen in a total of 4 categories: Urban Design/Master Planning, Historic Resources, Interior Architecture, and Architecture. And, announced January 15, congratulations to the People's Choice Award winner: STUDIOS Architecture for One Franklin Square Building Enhancements. Have Facebook? Like the AIA|DC Facebook page and then like your favorite photo in the 2016 Chapter Design Awards album! Please like only one photo, multiple likes will be disqualified. Don't have Facebook? Vote using our online survey! Voting will close at 12:00 PM EST December 15. The likes from the Facebook album will be tallied along with the votes from the online survey. 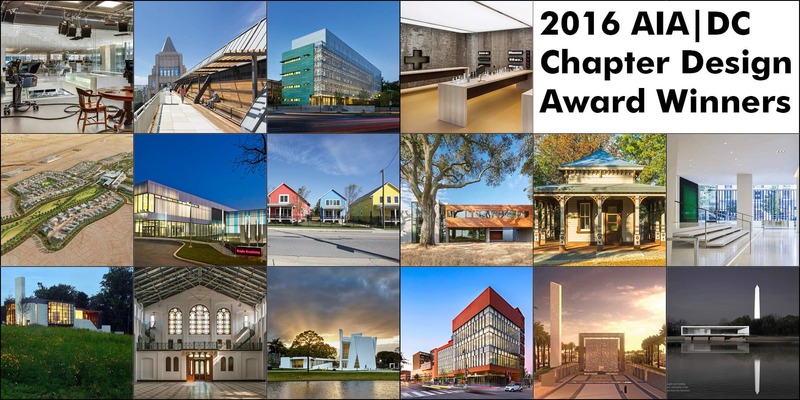 Join us for the awards reception on the evening of December 15 at the District Architecture Center as we announce the winner of the 2016 Chapter Design People's Choice Award. Opinions expressed in the blog and by outside commentators do not necessarily reflect the policies or views of the Washington Chapter/AIA or its officers, directors or employees.